Haidar: "EU fisheries in Western Sahara must be stopped"
“The Sahrawi people does not benefit from this agreement, signed between Morocco and the European Union. Regrettably, the agreement instead intensifies the Moroccan repression against the Sahrawi people”, Aminatou Haidar told Western Sahara Resource Watch in an interview. The EU has since 2006 been paying Morocco to fish offshore Western Sahara. 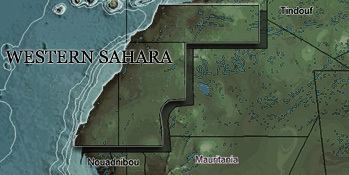 The territory of Western Sahara, which is treated as a colony by the UN, has been under Moroccan occupation since 1975. Simultaneously Morocco is profiting from their control over the territory by selling fishing licences to the EU. Haidar stated that the Sahrawi living in the occupied territories have never been consulted as to whether they would like such an agreement, and that the EU-Moroccan partnership therefore must be in violation of international law. She praised Sweden for taking the position that the EU fisheries is illegal, and commended the international solidarity movement for campaigning the issue of the international plunder of the natural resources of the territory. “Your campaign against the plundering of natural resources is very important. You should accelerate the campaign so that it contributes to stop the EU fisheries agreement”, Haidar commented to WSRW. The statements were given as she visited the US recently, upon receiving the Civil Courage Prize by the Train Foundation. Haidar was last year also awarded with the Robert F. Kennedy Human Rights Award. You can support the Sahrawi’s call to stop the EU plundering of Western Sahara by signing a protest letter to the European Commission. Sign the protest letter on the pages of the FishElsewhere campaign. Western Sahara Resource Watch (WSRW) is behind the campaign to stop the fisheries agreement between the EU and Morocco. WSRW is a network organisation represented in 35 countries internationally.